In the last decade web design trends have changed significantly; we’ve witnessed an array of trends from 3D designs with wild colors to flat design with calm pastel colors and we’ve even surpassed the “Who cares about mobile designs?” to a mobile first approach and many, many more. We often come across websites that are anything from 4-7 years old and sometimes even older. I know you guys don’t want to hear this but the latest industry research recommends that you should redesign your website at least once every 2-3 years. Yes, you’ve read it correctly…every 3 years! Why? Well technology is constantly evolving from design trends, new devices and even the tools we use to market ourselves. So if we’re changing all of these things, I’m afraid it’s also time to change your website. Now, nobody is forcing you to redesign your website! This is your decision but remember, if it’s not you making the change, you can be sure your competitor down the road is thinking about it. Don’t ask about the cost of a new website. Ask what is the cost of not having a new website. The best example is responsive design. Whenever you browse a website that is not mobile optimised you are bound to close it really fast. Responsive web design is something that you should expect as a mandatory element when requesting a new web design proposal. As an agency we are telling you now, if it is not included in the original price, search elsewhere because mobile and desktop design need to be coupled together – that is as long as you are not looking for a completely different, custom mobile design! 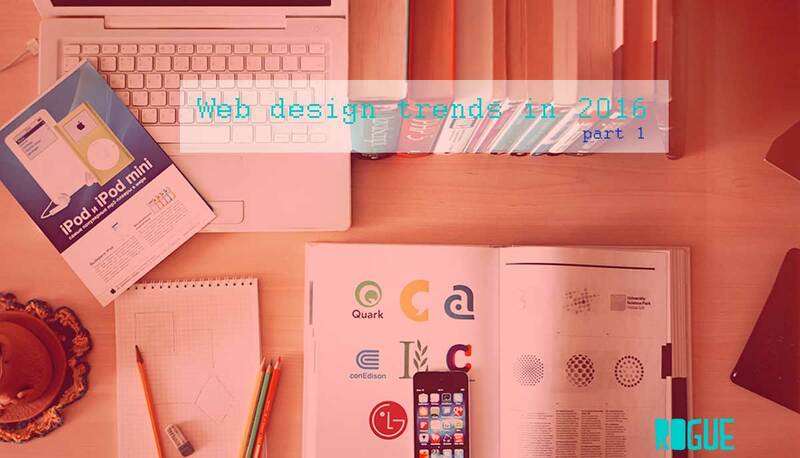 Now that we have that settled, let’s talk about upcoming web design trends in 2016. Every website needs to tell a story – whether it’s a story about your company, product or the person behind the scenes it needs to be interesting, eye-catching and easy to use! This year is all going to be about interactivities, amazing storytelling and interesting animations. All the big brands have started creating interactive web sites with interesting storylines such as Peugeot’s Catch the Dragon, Milka’s Christmas Express, Ford’s Fast Back to name a few. One simple change you can make to your website to make it more engaging and interesting is to update your subscribtion form. Let’s assume you have the basic Name and Email field. Simply use the name field to say thanks after a client has registered. These simple gestures make the user feel more comfortable using your page which in turn increases the likelihood of the user returning to your site again. A large majority of new websites use big HD images (we will discuss that in one of the next articles) to represent either products or showcases. And to be honest most of them look stunning! Unfortunately not all of them are well optimized for all devices or slow broadband but they are still amazing. Hope you enjoyed my first blog post ever! If you did feel free to join me on next post during next week when we will discuss Flat designs and call to action!